« Willie or won’t he? Prince William to take up work with animal charities. Eagles, wind farms don’t mix. New US study shows toll on birds. The toll on eagles from wind farms is documented in a new study from undertaken by US government biologists. The wind industry said it was working with the government and conservation groups to find ways to reduce eagle fatalities related to wind farms. 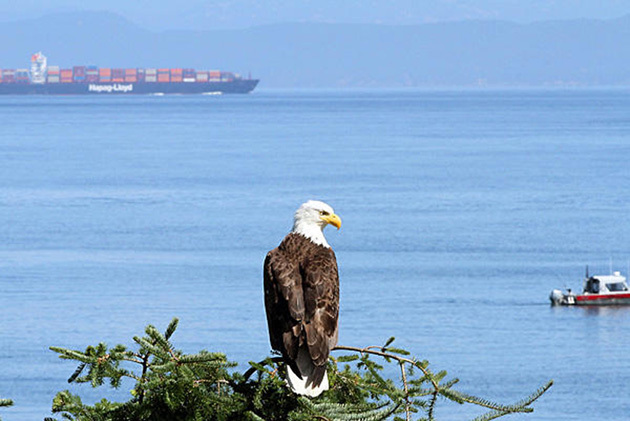 A bald eagle looks out over the Strait of Juan de Fuca at the Salt Creek Recreation Area in Port Angeles, Wash. Eagles striking wind farms is an issue as the wind industry grows. American wind energy facilities have killed at least 67 golden and bald eagles in the last five years, but the figure could be much higher, according to a new scientific study by government biologists. The research represents one of the first tallies of eagle deaths attributed to the nation’s growing wind energy industry, which has been a pillar of President Barack Obama‘s plans to reduce the pollution blamed for global warming. Wind power releases no air pollution. But at a minimum, the scientists wrote, wind farms in 10 states have killed at least 85 eagles since 1997, with most deaths occurring between 2008 and 2012, as the industry was greatly expanding. Most deaths — 79 — were golden eagles that struck wind turbines. One of the eagles counted in the study was electrocuted by a power line. A trade group, the American Wind Energy Association, said in a statement that the figure was much lower than other causes of eagle deaths. The group said it was working with the government and conservation groups to find ways to reduce eagle casualties. “It is not an isolated event that is restricted to one place in California, it is pretty widespread,” said Brian Millsap, the national raptor coordinator for the U.S. Fish and Wildlife Service, and one of the study’s authors. The study excluded 17 eagle deaths for which there was not enough evidence. And, in a footnote, it says more golden and bald eagles have since been killed at windenergy facilities in three additional states — Idaho, Montana, and Nevada. It’s unclear what toll the deaths could be having on local eagle populations. And while the golden eagle population is stable in the West, any additional mortality to a long-lived species such as an eagle can be a “tipping point,” Millsap said. Documents obtained by the AP under the U.S. Freedom of Information Act show that in two cases inIowa federal investigators determined that a bald eagle had been killed by blunt force trauma with a wind turbine blade. But neither case led to prosecution. In one of the cases, a bald eagle was found with a missing wing and a leg in a corn field near a turbine at EDP Renewables North America LLC’s Pioneer Prairie facility in Iowa. But the report says, “due to the sensitive nature of wind farm investigations and the fact that this investigation documented first violation for EDPR in Midwest, no charges will be pursued at this time.” The report lists four other golden eagle deaths at a wind farm operated by the company in Oregon. The company did not return emailed questions about the incidents from the AP. The Fish and Wildlife Service, which employs the six researchers, has said it is investigating 18 bird-death cases involving wind-power facilities, and seven have been referred to the Justice Department. The authors noted the study’s findings do not necessarily reflect the views of the agency, although some of their data was obtained from staff. Meanwhile, the wind energy industry has pushed for, and the White House is currently evaluating, giving companies permission to kill a set number of eagles for 30 years. The change extends by 25 years the permit length in place now, but it was not subjected to a full environmental review because the administration classified it as an administrative change. Wind farms are clusters of turbines as tall as 30-story buildings, with spinning rotors as wide as a passenger jet’s wingspan. Though the blades appear to move slowly, they can reach speeds up to 170 mph at the tips, creating tornado-like vortexes. In all, 32 facilities were implicated. One in Wyoming was responsible for a dozen golden eagle deaths, the most at a single facility. 2 comments to Eagles, wind farms don’t mix. New US study shows toll on birds. Is it possible that a wind farm company could be held liable for the death of a protected species, like a Golden Eagle, if that bird was killed or injured in a collision with a rotor blade? The increasing introduction of wind turbines into upland and highland areas will multiply the collision rates and deaths of these raptors. Wind energy companies produce rotor collision prediction statistics for each proposed wind farm as part of the planning application; they are actually predicting the death of various raptor species, so why should this be deemed to be legal? In my opinion this is as illegal as intentionally planning and carrying out the destruction of a raptor using the more traditional methods of poisoning, trapping or shooting but escapes condemnation because wind farms are promoted as being environmentally friendly and a future energy necessity. In reply to the question about wind energy companies being held liable for eagle deaths, yes they can be held liable. It’s a complicated, conveluted, government-administered “monster” that seldom if ever occurs. These wind energy companies are allowed to legally cull eagles & other raptors before the birds ever get a chance to fly into a turbine. These businesses have been issued 5-year permits to kill eagles outright as a means to reduce their impact on wind energy equipment. The real shame is that the 5-year renewal is about to be turned into a license that will instead now require renewal every 30 years!!!! From what I’ve read, this time period (30 years) is about how long the equipment lasts. As improvements in turbines for wind energy advances the lifetime of the equipment it is expected extend. In about 20 years we can expect the next petition for an extension in legal culling—or “take”—permits for raptors by “green energy” is expected to be a permit that won’t have to be renewed for 100 years. Sadly, very few people even realize this is going on. By the way, this kind of thing is happening in every country whose government promotes wind energy (not just the USA).